How do you bring a myth alive for a contemporary audience? What does it take to get audiences to identify with something ancient in a modern context while still maintaining some connection to an older artistic tradition? These are questions familiar to director Mary Zimmerman who has had several notable projects that do just that including her Tony-award winning production of Ovid’s Metamorphoses from 2002. Her latest adaption of a traditional myth or fable opened up earlier this month at the Oregon Shakespeare Festival and is based on the Chinese legend of the White Snake. 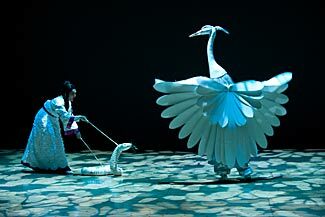 Zimmerman’s play, The White Snake bears the familiar hallmarks of many of her other adaptations including startling visuals and a preference for a modern, plain vernacular for the characters’ speeches. The show also makes clear reference to the multiple and varied versions of the story that have existed as part of the oral and written traditions used to hand the story down over time. And it is precisely these moments, the more philosophical and ambiguous ones that work the best in Zimmerman’s current staging. The basic elements of the story concern a hundreds-of-years old white snake that has developed magical powers over time through study including the ability to take human shape. She does, and soon she, with the assistance of her sidekick, a green snake also transformed into a woman, becomes involved with a human male. However, the relationship is eventually exposed by a monk who condemns it as forbidden by natural law. The overtones in a contemporary political climate are obvious, but Zimmerman never directly drags the issue of gay marriage rights into the open in the show. She is still plumbing the same contemporary strains that have recast the myth as a story of forbidden love with two lovers who must overcome their own secrets and opposition by outside moral authorities to be together. That the show is running in repertory with a new production of Romeo and Juliet is clearly not a coincidence. Zimmerman’s keen eye for beautiful stage images gives this story of love and morality an ideal setting. 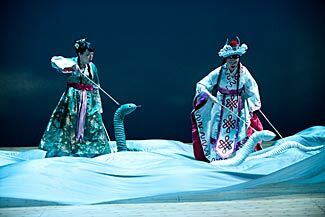 A largely bare stage sets off the opulent folk-influenced Chinese costumes of the cast. There is a significant amount of video material used for projected scenery and Zimmerman makes broad use of puppets and other enhanced costumes à la Julie Taymor to manage the animal parts of the story line. Ribbons of fabric fall from above like rain and there is one gorgeous tableau after the next in a show with some of the best scenic design and lighting I’ve seen in years. Those credits go respectively to Daniel Ostling and T.J. Gerckens and honestly are reason enough to see the show. And yet not quite everything clicks as well as it might. There are some profound and outright touching moments in the piece, and Zimmerman and her excellent ensemble cast milk them all. But she’s also going for a very broad palette here, not unlike a Shakespeare play with a little bit of everything from comedy to romance to drama. And while the story is big enough to handle all of these even in the one act, 100 minute running time, the balance feels off. The comic moments in particular can come off pandering at times in the direct, modern language of the text. The audience I saw the show with was not above big group sighs over a romantic kiss or applauding the villain getting his comeuppance. And while every audience is different, it highlighted some of the more manipulative aspects of the scenario which tended to undercut some of the bigger emotional truths and philosophical points The White Snake tries to score later on. Which makes the show a sentimental journey to be sure, but it's still one ultimately very much worth taking. I wasn’t going to write about the whole “woman composer” thing. I hold with those that feel the qualifier somehow invites people to take the work of composers who are women and hold them to a standard that is different and doesn’t serve anyone very well. Plus I can’t think of anything to say that Lisa Hirsch didn't say better already in her excellent 2008 piece for New Music Box. * And yet, as Lisa Hirsch points out, speaking of women composers as well as women conductors is in other senses unavoidable when faced with the stark difference in the opportunities they’ve been afforded in the classical music world. There is still a battle to be waged, and Marin Alsop and her Baltimore Symphony Orchestra, which stopped in Orange County as guests of the Philharmonic Society on Wednesday, did so with an unambiguous agenda in this regard. The BSO has taken up a seasonal theme of adventurous women and are featuring the works of contemporary women on their current program. Furthermore, the programming itself brings the issue front and center as Wednesday’s show opened with Copland’s Fanfare for the Common Man paired with Joan Tower’s Fanfare for the Uncommon Woman. The piece is Tower’s most frequently performed piece and one she dedicated to another trailblazer, BSO Music Director Marin Alsop. I can’t say the pairing of fanfares, both of which use the same instrumentation, told me very much about any gender divide in music or the world of its performance. But what was true here, and throughout the rest of the evening was just exactly how exciting it was to see Marin Alsop conduct. She has magnificent stage presence and a strong sense of dynamics. And truth be told, despite my many years as a concert goer, I must admit that seeing a woman on the podium of a major orchestra in this way adds to that excitement for me. Yes, this is progressively a more frequent event, and I can rattle of over a dozen other women conductors I’ve had the pleasure to see perform live. But there is something about Alsop and her command of the music and her relationship with this orchestra that rivets. I wish I could say the same for the music of composer Jennifer Higdon. The other major work on the first half of the program was her Percussion Concerto composed for Colin Currie who was on hand to play it. In some ways the concerto does have an unusual structure in that the soloist not only interacts with the orchestra as a whole but also specifically with the other players of the percussion section in particular at several points throughout the seamless single movement. But despite this, the writing overall takes the most pedestrian of forms with the soloist providing a number of virtuosic turns on a variety of different instruments while the rest of the players generate music that is unvaryingly the same from moment to moment. Currie is a remarkable player though and did pull off some pretty spectacular playing in the showy part written for him. Yet in total, it was a similar experience to Aho’s recent Clarinet Concerto that popped up with soloist Martin Fröst with the Los Angeles Philharmonic last week – whimsical, but ultimately hollow. The L.A. Philharmonic was on my mind again in the closing piece of the program, Prokofiev’s Symphony No. 5. If you closed your eyes on Wednesday you could easily imagine yourself in Walt Disney Concert Hall, and not just because the L.A. Times’ Mark Swed and the L.A. Phil’s Deborah Borda were in the room. And I intend this statement to be taken in all the ways it could be construed. Alsop choose some deliberate methodical pacing in the later movements of the symphony that turned things boggy, but at other moments there was a clarity and detail to be admired. The sound was peculiarly American, harking back to the Copland that opened the night with broad almost optimistic attacks that, while certainly congruent with the work’s 1945 premiere, felt a little less like the Moscow of that eventful post-WWI evening and more like, well…Baltimore. Alsop punctuated the evening with a snippet of Borodin's Polovtsian Dances before sending off the very enthusiastic Orange County crowd who seemed to share my warm feelings for her and her orchestra. And that seems as much like the face of progress as anything else I can think of. *If I'm not mistaken, Ms. Hirsch's piece made her the big winner of the 2008 Best Arts Blogger in North America Prize for her response to the prompt "Women composers. Now what do they want?" However, I may be mistaken about this. It’s not too early to start planning for your 2012 summer. And if your interest is theater, your best bet is Ashland, Oregon where the Oregon Shakespeare Festival kicked off its 76th season in February and will reach its full summer schedule in June with nine concurrently running productions. There are lots of summer Shakespeare Festivals around the country, but OSF, under artistic director Bill Rauch has bigger, bolder, and more surprising offerings than most. This year’s line up promises to continue with Rauch’s focus on inventive modern stagings and new American plays. The company’s current new play commissioning program, American Revolutions, which produced Culture Clash’s wonderful American Night from 2010, will see two new premieres this summer. The first of these, and one of the two projects Rauch himself will direct this year, is Robert Schenkkan’s All the Way, which will revisit LBJ’s first year in the president’s office in 1963 following Kennedy’s assassination. The other new play on this year’s schedule takes off in the same time period and moves forward. Chicago theater collective UNIVERSES will collaborate with OSF’s resident artists for Party People about former Black Panthers and other revolutionaries now facing their legacy several decades on. Both of these shows enter the repertory in July and run through the end of the season in November. Of course, Shakespeare’s name is in the festival’s title, so there is plenty of the drama that made English what it is today to choose from. I personally am most excited about Rob Melrose’s new Troilus and Cressida, which is being produced in association with New York’s Public Theater and which moves the action to the contemporary Middle East. The show will open later this week at the New Theater which next year will be renamed the Thomas Theater in honor of OSF's former longtime Development Director Peter D. Thomas. There are other fresh takes on the English master. In the outdoor Elizabethan Stage in June, Christopher Liam Moore will move Falstaff’s tormentors stateside in The Merry Wives of Windsor, Iowa. And indoors at the Bowmer Theater Laird Williamson is offering a 19th-century California setting for Romeo and Juliet. The rest of the outdoor stage programming for the summer months rounds out the Shakespeare part of the festival with the usual high-quality OSF production values in somewhat more traditional stagings of As You Like It and Henry V.
Much of the rest of the indoor season in Ashland is already underway and includes a number of promising choices. There is comedy, of course, and the company has chosen to revive Kaufman and Ryskind’s Marx Brother’s vehicle Animal Crackers for the Bowmer stage. And on the dramatic side, former festival director Libby Appel returns to direct her own new adaptation of Chekhov’s The Seagull at the New Theater. But perhaps the two most intriguing experiments on the schedule are the Tony award-winning director Mary Zimmerman’s theatrical adaptation of the Chinese fable The White Snake and Bill Rauch and Tracy Young’s wild musical mash up interweaving the stories of Medea/Macbeth/Cinderella. The scope of this latter project doesn’t arrive for a few more weeks but it does keep up the adventure quotient in one of the country’s best theatrical getaways. I’ll be reporting from the festival twice this year including this coming weekend so stay tuned for reports, but in the meantime, check out their site for further details on schedules and tickets. The festival is running now through November 4. And don’t forget to spend at least some of your summertime indoors. If there is anything that’s been reinforced to me lately, it’s that conflict, real or manufactured, seems to draw people’s attention. Even in the field of classical music, the whiff of a cross-country rivalry between Los Angeles and New York serves to do all kinds of things. It’s a marketing strategy for music festivals, and it’s an idea that certainly sells whatever it is big media conglomerates still sell these days the way it crops up again and again in the writing of people who should know better. I was reminded of this on Saturday when I heard a story regarding one of L.A.'s most prominent public writers on all things classical music. Allegedly after hearing a new composition from a young ex-Los Angeles based composer who now resides in Brooklyn, the writer was purported to have remarked about how the composer has “gone soft” now that he works in the apparently toxic confines of Brooklyn. You see, every time you insult New York in Los Angeles, an agent gets his wings. But luckily, local artists of the musical variety at least are having none of this garbage as evidenced by two local programs that mostly celebrated the connection between themselves and their peers on the East Coast albeit in different ways. What’s more, Brooklyn-based composer Timothy Andres’ music featured prominently in both. Andres was the star attraction at this weekend’s Los Angeles Chamber Orchestra concert, which I saw Sunday in its Westwood incarnation. Andres was commissioned as part of the group’s Sound Investment program with donations from individual audience members to bring new work to life. Andres was this year’s choice, and the result was a remarkably interesting 13-minute piano concerto entitled Old Keys. The single movement highlighted Andres' familiarity with 20th-century American music history, but had an accessibility that brought later John Adams immediately to my mind. And while the piano part, which Andres played himself, was no virtuosic tour de force, it subtly achieved its own greatness fully integrating itself within the context of the larger orchestration. This was not the usual individual-vs-society concerto model but something far more nuanced. As Andres' himself pointed out, it's a restless piece constantly on the move, looking for something though not necessarily in an agitated way. If there was any complaint, it was that the piece ended far too quickly as if it were only the first movement of some larger, much more ambitious work. Andres didn’t completely pass on the virtuosity, however. He followed Old Keys with his recomposition of Mozart’s Piano Concerto, No. 26. As music director and conductor Jeffrey Kahane pointed out before the performance, it is not a well-loved piece by many soloists. This is in part due to the fact that Mozart didn’t write out the music for pianist's left hand which Mozart himself likely improvised on the spot or played from his own memory in performance. Other composers have had a stab at fleshing this sizable gap out, but Andres took a radically different approach, creating a related but completely independent part not intended to conform or mimic Mozart’s style. The result is fiendish to play and nearly schizophrenic, the right hand almost unaware at times of what the left is doing. The orchestra speaks to the soloist as if through a translator or across time in something that feels contemporary in a twisted sort of way. Just to put a point on it, Andres played his piano transcription of Mahler’s “Des Antionius von Paduas Fischpredigt” from Des Knaben Wunderhorn as an encore. He left no doubt in this room that he’s a major talent with some incredible music yet to come. All this bi-coastal good feeling served as a template for the young upstart wildUp collective that returned to Venice’s Beyond Baroque this past Friday and Saturday. The theme was a mocking nod to a N.Y. vs L.A. rivalry with the ensemble playing pieces predominantly from young composers working in either city. The intent wasn’t so much to draw a contrast as it was to point out similarities in two burgeoning music scenes. In the best ironic twist of all, music director Christopher Rountree, who contributed a piece based on Walt Whitman’s ”Brooklyn,” was absent from the show except by pre-taped message as he was in that very same borough this weekend helping out with the Brooklyn Philharmonic. See how easy that was? And nobody had to get off a high horse to do it no less. 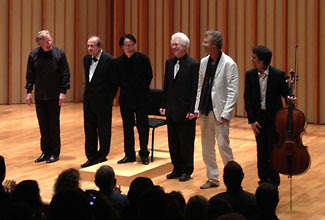 Andres’s music featured prominently here as well with the group playing several chamber-sized pieces, many of which had previously been heard as part of the Los Angeles Philharmonic’s “Green Umbrella” new music series. The impressive pianist Richard Valittuto showed that Andres is not the only one who’s capable of making How Can I Live in Your World of Ideas? sound great. Andres’ Ives-inspired Some Connecticut Gospel was also in the first half of the program and was played with as much New England pluck as you could wish from any ensemble. Andrew Tholl revisited Missy Mazzoli’s solo violin piece via Bach, Dissolve, O My Heart, and participated in the violin octet that gave the juice to Andrew Norman’s Gran Turismo. Norman will be taking over the composer in residence spot at LACO starting next season so local audiences will hopefully to get to hear more of this kind of great music. These pieces bristled with invention, all very inviting, and, from the look of things, as fun to play as to hear. The Los Angeles part of the program kicked off with a comical piece from Art Jarvinen, Egyptian Two-Step, that made ample use of the hissing from compressed air canisters with the players breaking out in smiles as wide as the audience's. From here things got a bit more serious with Odeya Nini's Shelter in Swarm, Andrew McIntosh’s Silver and White and Andrew Tholl’s Corpus Callosum, which all showed the markings of European modernism. I was perhaps most taken with Rountree’s Brooklyn, which provided chamber accompaniment to a pre-recorded reading of Whitman’s poem. Whitman’s language is as stunning as Ives’ music and Rountree craftily follows along matching the emotional fervency in the building vision of a city from the water. It was all very exciting stuff in large part due to the commitment and excitement of the players. Granted, sometimes that excitement cut into their ability to sell the music in a serious fashion with a rotating roster of emcees for the show who were too inclined toward a little humorous self-deprication, which can go a long way; more than that goes way too far. But better this than something boring, which wildUp never is. Again proving that, yes, we can all get along and have a good time without highlighting our divisions to do so. Who would have guessed? Los Angeles concert stages were jam packed with new music this weekend. Living composers from both home and abroad were featured by local ensemble from the rambunctious wildUp to the Los Angeles Chamber Orchestra to the august Los Angeles Philharmonic. I’ll have more on the former later, but let’s start with Saturday’s L.A. Phil concert conducted by the well-regarded music director of the Minnesota Orchestra Osmo Vänskä. It was probably the most Finnish-oriented program the L.A. Phil has ever presented in the absence of former music director Esa-Pekka Salonen; a reminder to local audiences that Finnish musical life does not being and end with the initials EPS. In addition to Vänskä on the podium, the concert featured the 2005 Clarinet Concerto Kalevi Aho wrote for soloist Martin Fröst (a Swede) as well as Sibelius Symphony No. 6. But before all that was Strauss’ Der Rosenkavalier suite that opened the evening. Vänskä took a measured approach that valued detail over grand gestures. But this is some of Strauss’ most crowd-pleasing music in any event and the crowd was clearly excited by it. It was an odd choice to start the show in this manner, in that it ended up inverting the typical flow of the program with the big familiar romantic piece starting the show instead of ending it. Complicating things further in this model was that despite the charms of both Aho’s concerto and Sibelius’ symphony, both end on decidedly somber and somewhat suddenly unexpected moments avoiding a telegraphed knockout punch. This isn’t to say that the ordering was a bad thing. In fact, I thought it rather inspired programming overall. The Clarinet Concerto followed, and Martin Fröst made it clear he knows how to put on a show. 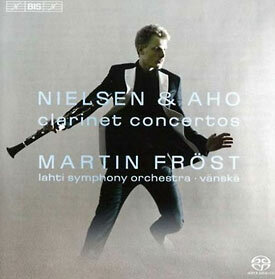 (Fröst has recorded the concerto along with Nielsen's clarinet concerto under Vänskä for bis.) He arrived in a dark suite covered unexpectedly in white piping suggesting that Mr. Thibaudet may now be handing out the phone number of his personal tailor. If Aho’s concerto is anything, it sits firmly in the standard concerto model designed to highlight a players virtuosity. Five minutes in to the thirty minutes work I began to measure my own breaths wondering how Fröst could play so much so fast without ever seeming to breath. There were a couple of oases of calm in this seas of notes, most notably in the final movement, but the clarinet part is relentless. Of course, this may be the work’s downfall as well. Minute to minute Aho’s writing feels very much the same and the unchanging nature of the work made it come off longer than it actually was. Fröst followed up with the inevitable Klezmer encore which also seemed popular with the crowd who thankfully did not dissolve into clapping. The Sibelius Symphony No. 6 that closed the evening is a rather odd work. It is all calm almost pastoral surfaces never stepping out of line for emphatic declamation or bombast. It’s sort of the opposite of a Shostakovich piece of music in a way. But it also isn’t particularly sweet and it never overly tried to endear itself, asking the audience instead to take it on its own terms. Vänskä and the orchestra again gave a detailed, well organized account right down to the end that comes as a surprise; not so much petering out as just stopping. It was a thoughtful, intriguing performance, though admittedly a hard one to wrap oneself up in. And that, too, isn’t always such a bad thing. The show repeats Sunday afternoon. Friday brought an unintentional coda to this month’s Piatigorsky International Cello Festival, which had wrapped up its final performances the Sunday before. The festival brought together dozens of world class cellists from all over the world for a huge variety of concerts, recitals and master classes featuring everything from Bach to Ligeti. Yet there was little in those two weeks that would have prepared us for the sound world that cellist Frances-Marie Uitti brought to the REDCAT on Friday night. Chicago-born Uitti is above all else a trailblazer. 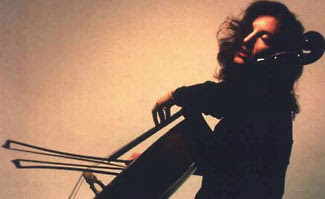 A composer herself, she advocates for new music and is known for developing her own extended techniques for playing, including the use of two bows in a single hand simultaneously greatly expanding the amount and types of sounds she can produce from a standard cello. She has written and commissioned new works to explore the sound world created with these approaches, a few of which were featured in Friday’s program. When it comes to rethinking the cello, Uitti wrote the book. And it's expected to be published by The University of California Press in the not too distant future. Much of Friday’s program featured works from the last 10 years by young composers, some of whom are California-based, including Michael Jon Fink, Gregory Moore, Karen Tanaka, Lisa Bielawa, and Ken Ueno. 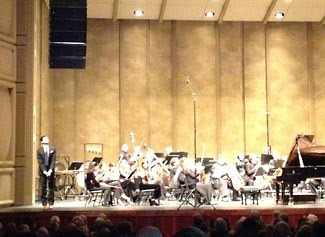 Both the Moore and Fink works were receiving their world premieres. Many of the pieces used a variety of electronically processed and prerecorded elements including, most provocatively, Moore’s Three Safe Places in which Uitti accompanies her own prerecorded voice describing a semi-autobiographical history of her own view of safety. Moore uses the cello sound to play with sound qualities of natural speech in what was one of the evening's highlights. 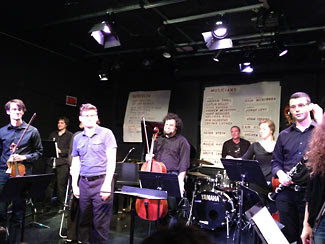 Uitti's two-bow playing technique was featured in several works including Fink's A Folio of Large and Small Worlds Ending, which also featured assistance from several other CalArts players. Perhaps the most compelling moments of the show, though, were the pieces that bookended the night, both composed by what Uitti herself referred to as old Europeans. British composer Jonathan Harvey has crafted several works for Uitti, and Curve with Plateau delivers a big punch with relatively simple terms. The solo part transverses the tonal range of the cello from low to high and back again as a simple metaphor for the range of human experience from physical to spiritual. Uitti manages the more delicate and fleeting parts of the piece without any hesitation giving the work a unity it cried out for. The night ended with a work from another long-time collaborator, the always unusual Giacinto Scelsi. Ygghur is the final segment of Trilogia an autobiographical work Scelsi intensely worked on for over a decade with Uitti while she lived in Rome. (She has performed the piece everywhere and recorded it for ECM.) Ygghur is the reflective summation of the larger work using a unique tuning and often reiterating single notes over and over again with only moderate changes in attack and timbre. Uitti's experience with the work again imbued it with a much broader sense of importance and cohesiveness than one might expect in other hands. It was a stunning close to a fascinating show from someone who isn't just a part of the world of cellists but is slowly changing the parameters of what that constitutes. Among all of Shakespeare’s plays, Antony and Cleopatra may have been the most screen worthy. Granted, he had no way of knowing that, but it is filled with the kinds of things that still spell green light for Hollywood studios – exotic locales in Alexandria and Rome, large scale fight sequences, recognizable characters, and a tragic love story. Yet it is the demands of all these things going on in the same relatively short time period while in a condensed space that may make the play a bit less popular to stage than Shakespeare’s others. There are big shifts in tone and a lot of (augmented) history for the audience to digest, and making it all hang together in an entertaining and believable way is no small feat. Pasadena’s A Noise Within kicked off their spring season with a new production of Antony and Cleopatra last month that has a lot to say for itself even if it doesn’t manage to pull all the loose ends together as well as it might. Central to the play's success are the title roles, and Susan Angelo who plays Cleopatra gives a lusty and engaged performance of the Egyptian queen dealing with the various psychological proclivities of her Roman neighbors. Angelo expertly milks scenes for all they’re worth including her rage with servants who’ve unwittingly become the bearers of bad news about her lover along the way. Opposite Angelo is company co-founder and production co-director Geoff Elliott who gives a comparable, subdued performance as Mark Antony. Antony’s got a lot on his mind at virtually every moment of this story, and Elliott reasonably goes for something along the line of the crisis management approach to the character. Most importantly, the relationship between the two rulers comes off as sincere and intimate against a canvas of political intrigue. Of course, there is a more than capable huge cast besides these two leads including the always enjoyable Robertson Dean as Enobarbus and Max Rosenak as Octavius Caesar. Yet Elliott, along with his wife and co-director Julia Rodriguez-Elliott, doesn’t quite manage to give the show all the gravitas it should convey. The humorous and romantic bits work well, but as the play turns into its final tragic acts things begin to unravel and the deaths of the main characters can ring hollow. 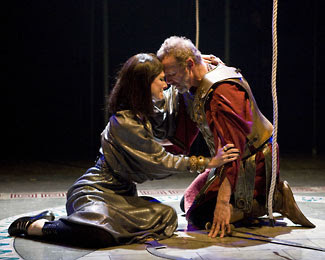 In Thursday’s performance certain moments during Antony’s death scene were met with uncharacteristic laughter from the audience and the subsequent scenes seemed to drag on to the end. However, there was other good news in that the company continues to explore and make use of their grand new space. The fight scenes here were bigger and more detailed than any the company has yet done, with Romans rappelling from the fly space above the stage. 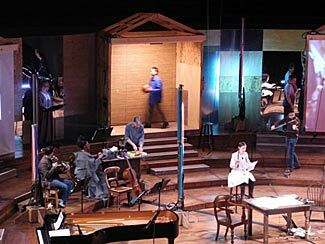 The cast managed to keep the almost cavernous space of the new theater from overwhelming the proceedings filling the room and drawing the audience in to the events on stage. On balance the company manages to get enough right in the show that it makes for a worthwhile theater experience and certainly much more enjoyment than most Hollywood blockbusters can deliver. The show runs in Pasadena through May 13. There are a couple of notable recital recordings I've been listening to lately. Both include unusual juxtapositions of off the beaten path fare that make them worth a listen. Soprano Marlis Petersen and her pianist Jendrik Springer have compiled a song cycle entitled Goethe-lieder: Das Ewig-Weibliche for Harmonia Mundi. Goethe's poetry, and especially these texts from the mouths of his heroines, have inspired some of the most beautiful and best known lieder from the likes of Beethoven and Schubert. 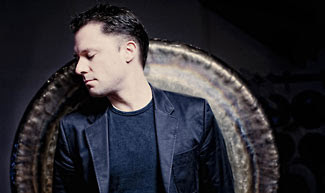 Petersen is mining other veins here, exploring Goethe's "eternal feminine" with unexpected settings of the same texts from other composers such as Wagner and Liszt. But the music goes even farther afield with the completely unexpected Charles Ives ("Ilmenau"), Tchaikovsky ("Nur wer die Sehnsucht kennt"), and Manfred Trojahn ("Bewundert viel und viel gescholten") to name only a few. Petersen sounds confident and solid throughout with excellent phrasing. Like any program with so many different composers in the offing, there are significant shifts in style and approach that Petersen and Springer organize in an effort to minimize any jarring contrasts. And while not all of these songs are going to stay with you forever, its a smart and fascinating program with a lot to think about. Meanwhile soprano Christine Schäfer recently made her switch to Sony and her first recording for them, Arias, may not carry an attention grabbing name. But no matter; her voice more than takes care of that job. Schäfer has managed a rather diverse set of roles already in her career leaving her mark in Mozart roles as well as Strauss, bel canto, and 20th century music. Arias captures that diversity with unexpected choices from Verdi's Otello ("Canzone del Salice"), as well as Handel, Bellini, Thomas and Strauss all performed with the support of the Deutsches Symphonie-Orchester Berlin under Julien Salemkour. Her tone is lovely throughout all of these numbers, but perhaps she is most impressive in the lone 20th century work on the program, Messiaen's "Ah! Dieu nous éblouit par excès de vérité" from Saint François d'Assise. 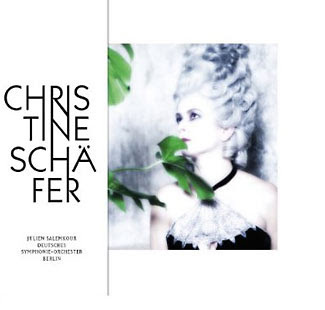 Schäfer is well known for the role of the angel in Messiaen's sole opera and the performance recaptures some of the shine from this glorious high-water mark in her career. 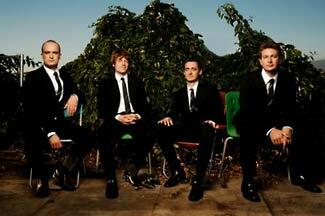 The Takács Quartet is one of those fixtures of the classical music world that seems almost impervious to time. Even after 35 years and a handful of personnel changes, they remain one of the finest chamber music ensembles in the world. They returned to Southern California on Tuesday along with pianist Garrick Ohlsson on their current tour as guests of the Philharmonic Society of Orange County to the intimate Irvine Barclay Theater. The program was part of the organization’s “Beethoven: The Late Great” series revisiting the monumental music the composer produced in his final years, and the evening did include his String Quartet No. 14, Op.131. It was the first time I’ve heard the current roster of Takács play this piece since their much lauded recording of the Beethoven string quartets and subsequent appearances in Los Angeles nearly a decade ago. Little had changed musically with the seamless addition of violist Geraldine Walther to the combo, and no one went away disappointed. It was lean, muscular Beethoven, now in full Romantic bloom, enchanted with rhythm and touchingly lyrical. It’s easy to complain about the omnipresent programming of Beethoven’s music, but this performance provided all of its own justification. The rest of the night was dedicated to the endlessly fascinating musical world of Shostakovich and the Piano Quintet in G minor with Ohlsson. The Quintet was composed in the halcyon days of the late 30s and early 40s when Shostakovich was on the rebound from his falling out with Stalin and his works were again warmly received by the powers-that-be even if they would sustain some outside criticism for the composer’s purported willingness to toe the party line a bit more artistically. Seventy years later, though, one wouldn’t mistake the music as having come from any other hand with its jarring combinations of military and carnivalesque elements. The opening Prelude and Lento was some of the most haltingly sad music I’ve heard played all year. The Takács players have the knack of delivering something that could be almost obscenely jocular but also knowingly weary at other times. Perhaps the only oddity here was that the Takács players and Ohlsson could be of two minds at moments. Ohlsson often went for a polished almost quintessentially classical feel, eschewing the temptation to deliver a poke in the ribs every now and then. But it may have been for the best, grounding the performance overall with some contrasting elements. The Takács players will continue their tour through the U.S., Europe, and Australia into the summer with appearance at Carnegie Hall next month, and if you haven’t caught up with them lately, now would be a great time. 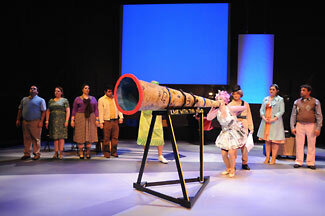 Pasadena’s A Noise Within Theater Company is spending much of the Spring in 17th Century France. They’ve had great successes with Molière before and The Bungler will open early next month. But perhaps more unusually, the company is also mounting an adaptation of Pierre Corneille’s comedy-drama-romance L’Illusion Comique from 1636. The play was radical in its day with a number of innovations including a play-within-a-play structure and broad shifts in tone mashing together elements of different genres. And while these devices aren’t unfamiliar to modern audiences, Cornielle’s original can still seem jarring and episodic. The play has enjoyed new found popularity in recent years however after playwright Tony Kushner completed a new translation and adaptation of the play streamlining some of its more circuitous plot turns. It’s this version that ANW brought to the stage last weekend in its new Pasadena home under the direction of Casey Stangl. It’s a fanciful story with young lovers and sorcerers that looks great on the more expansive thrust stage of ANW’s new space. The company has always managed illusions well, but in Pasadena they have a chance to look grand. The action follows an older man, Pridamant, who has come to the cave of a sorcerer, Alcandre, seeking to learn about the fate of his son whom he had abandoned many years before. Alcandre summons a number of visions that relate episodes from the son’s life in his father's absence. However, each vignette unfolds in a slightly different context with the names of al the players, including Pridamant’s son, slowly changing from one segment to the next. And like Corneille’s original, there is a little bit of everything from romance to the pastoral. But Kusher leans heavily on romantic comedy overall and the main thrust of the drama tells the story of how the son and the young woman he loves become connected and stay that way. And yet despite the unusual structure and episodic nature of the play, this production is extremely engaging for the most part. Stangl’s sense of timing is key and some of the best artists on the ANW roster have plum roles. Deborah Strang plays Alcandre with an air that is equal parts Prospero and Puck. She interacts very little with the cast of the son’s romantic world which includes a number of stock characters such as a buffoon expertly managed by the very funny Alan Blumenfeld. 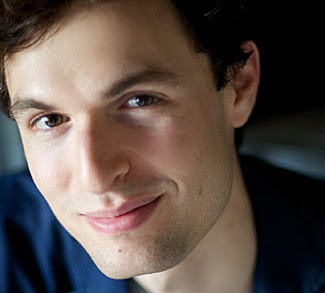 The dashing Graham Hamilton plays the sons' parts opposite Devon Sorvari’s paramours in a Tales of Hoffmann-inspired way. Abby Craden makes her mark in the conniving maids' roles. Each vignette builds upon the next with parallels drawn between ostensibly different characters throughout the text. The play does have several wistful and melodramatic bits but the show hits all the right notes with its reflections on aging and staying current in a world that rapidly passes us by. This is a great chance to see a relative stage rarity and as usual ANW has put together a high quality, dramatically satisfying take on a play that is remembered for good reason. Last week the Spring for Music Festival, an annual New York-based concert series at Carnegie Hall celebrating adventurous programming by North American orchestras, announced a contest to pick the best English-language culture blogger in North America. The contest involves bloggers writing responses to a series of prompts while a panel of judges and the voting public slowly whittles away the dross to determine a virtual champion. As a member of the likely target audience for this endeavor, I wasn’t particularly taken with the idea for several reasons. Chief among these was the first writing prompt. To wit: “New York has long been considered the cultural capital of America. Is it still? If not, where?” This strikes me as a proposition so preposterous that not even the most myopic Park Slope hipster would take it seriously. It smells like bait to me; the kind of thing intended to inspire vigorous debate but instead almost automatically squelches it. But maybe it’s to be expected from an organization whose mission statement touts that they “provide a vehicle for orchestras to showcase their artistic creativity in a concentrated and highly competitive format in the world’s most renowned concert venue.” And as innovative as the American Idol model of concert programming development and online arts commentary may be, I think I’ll pass. But then The Washington Post’s Anne Midgette is all, like, bring it. And thus, it is brought. But I digress. Tearing down the New York arts scenes or building up some other city’s isn’t the kind of Marxist examination of political economy I care to engage in. And as much as I love the benefits of a “highly competitive format” as much as the next guy, I think there are far more important and interesting questions and considerations to make about the culture of North America. (I’ve always considered myself a Mille Plateaux kind of guy if you know what I mean.) Still there is an invitation here to think about my own beloved, schizophrenic Los Angeles, and the way it has created itself and the rest of America–if not the world–up until recently. Although it’s an era that is rapidly drawing to an end, it is Los Angeles, in a geographic sense, and Hollywood in a metaphorical one, that has been preeminent in the latter half of the 20th century, not so much as a site of access to culture, but as the source of creation for all of the consumers of that culture to begin with. The advent of mass-oriented film and television businesses that make L.A. an industry town has done more than just create cultural artifacts to be consumed by a worldwide audience. In fact, it is the euphemistically titled “entertainment industry” that has itself created America and the Americans that inhabit if for several generations. Of course, I don’t mean this physically, but more in a subjective, ideological sense. It is Los Angeles that has been the primary source of mass-produced images that have defined virtually every aspect of American lives psychologically until perhaps just the last few years. For example, Verdi and Wagner both had plenty to say about families that still resonates with audiences today. But I would argue for better or worse a string of images from The Cleavers to the Karsashians have exerted far more comprehensive power over how Americans imagine themselves a part of a family or not. Yet whether these images are validated or rejected by individual viewers, in the end they define the very terms of debate on a full range of sites of contestation. This is a living, dynamic process where the means of image production and distribution have remained relatively constant for several decades. It is only recently as the mass part of the mass media has started to wane, that the relevance of these references, or better yet the increasing multiplicity of images Americans are asked to process and contend with, has started to recede. With the cultural capital of the filmed image returning less and less, the identities of Americans and their very subjectivity is being contested in new ways. There are so many more voices in an increasingly technologically interconnected world. How do we locate intellectual authority and how do we continue to know what we thought we used to? This is as true in arts commentary and criticism as it is elsewhere. And perhaps this is part of the thinking of the Spring for Music blogger contest. We’ll sort out who knows what they are talking about and who doesn’t with a panel of judges and a voting public like some televised singing competition. 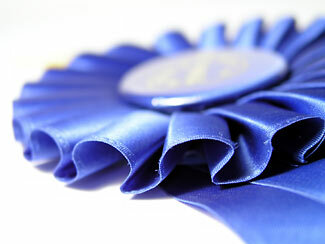 But I suspect the blue ribbons have already been handed out elsewhere and will continue to be so. Smoke on your pipe, and put that in. The inaugural Piatigorsky International Cello Festival has been taking place in town over the last two weeks. I’ve not had the time I’d wished to attend many of the events much less actually get around to writing about some of the great living cellists who’ve made rare appearances here. On Saturday, I did attend one of three festival performances with the Los Angeles Philharmonic each featuring a different cellist, performing different pieces for cello and orchestra. Saturday drew my interest since it featured Mischa Maisky playing one of the thorniest of the standard cello concertos, Shostakovich’s First, which he originally composed for Mstislav Rostropovich in 1959. It can be boisterous but is also filled with some brutal solo passages with aggressive attacks and defiant pizzicato. It was last heard here in 2007 with the L.A. Phil's own principal cellist, Peter Stumpf. Maisky went for high drama and crafted solos that were more about the forceful texture of the attack than precision. It was fair enough, but I sometimes felt that the bigger picture of the work was slipping out of reach. Maisky also delivered a rather odd cello transcription of Lensky’s aria from Tchaikovsky’s opera Eugene Onegin. It was filled with effects I assume were meant to replicate vocal performance, but ended up sounding rather breathy and mannered overall. There was an encore, the Sarabande from Bach’s unaccompanied cello suite No. 5, arguably the best known of Bach’s music for cello. It too felt somewhat rough-hewn, lacking a certain subtlety. The rest of the program consisted of Dvorák’s Carnival Overture, which opened the evening and Shostakovich’s Symphony No. 5. Both were given somewhat workman like readings under the baton of Neeme Järvi who was returning to the L.A. Phil for the first time in nearly two decades. Shostakovich’s Fifth Symphony is one burdened in recent years with the weight of extra psychological interpretation. It was the composer's comeback moment after his first artistic falling-out with Stalin. And while it got him back in good with the musical powers of the moment with its patriotic, almost propagandist manner, its story was far from over. In recent years, some parties have interpreted the work as a deceptive parody of or a commentary on the Communist system under which Shostakovich struggled to contend with as an artist. Järvi was having none of this, taking the symphony on its own terms in a performance that was spirited, but straight-forward and never on fire. It was nice, which is a word that the best Shostakovich performances should never strive to be. I was far more impressed with the marathon evening presented last Sunday as part of the Piatigorsky Festival when all six of the Bach cello suites were presented at Zipper Hall, each played by a different cellist. These works weren’t designed to be played together, and when they are it can be a bit of a slog. 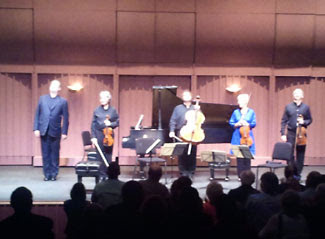 But the festival organizers were smart in crafting a show that gave the sold out crowd a lot to consider with the different interpretive choices of the six soloists who included (in order from Suite 1 through Suite 6) Ronald Leonard, Frans Helmerson, Jian Wang, Thomas Demenga, Miklós Perényi, and Jean-Guihen Queyras. The differences could be remarkable and the playing was often exciting in very different ways. Demenga tore through the Fourth like a house on fire almost turning mechanical at times. This was followed by one of the true greats, Perényi, whose studied, lyrical version of the Sarabande from the Fifth Suite left the version from Saturday night from Maisky on the cutting room floor. But then there was the almost explosive Wang whose version of No.3 sounded orchestral in scope as if he were playing for an entire section of cellos. It was an evening of many voices that underscored the magic of Bach not only in the music's beautiful construction but in the vast room within it for interpretation in the context of performance. And while not all that excitement found its way into Saturday's L.A. Philharmonic performance, the cello suites were certainly a highlight of the festival. There are four events in the next two weeks that are worth mentioning, and even more worth seeing, that you may have overlooked. So put down those Billy Squire LPs you're spending so much time mooning over and don’t make that mistake again. 1) While there are some arts organizations in Los Angeles that would like you to believe that youth and community arts program was invented in South America over the last decade and was only recently imported to the U.S., the reality is most organizations have had just such operations for a very long time thank you very much. Case in point, the Los Angele Opera and music director James Conlon have made an annual trek across the street to Our Lady of the Angels Cathedral to present one of a number of rotating community-based musical productions on an appropriate theme for the setting. 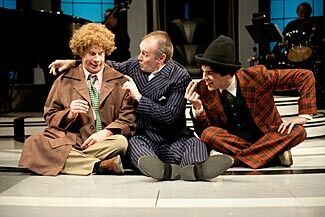 Past years have featured Britten’s Noye’s Floode and a version of the Jonah and the Whale story. This year, Conlon and his large orchestra and chorus made up of a variety of community players including over 400 children and the Hamilton High School Symphony Orchestra will remount The Festival Play of Daniel on Friday the 17th and again on the 18th downtown. The pastiche of Medieval music has been re-orchestrated, arranged, and directed by Eli Villanueva, the resident stage director of L.A. Opera’s Education and Community Outreach programs. The show is bigger and more ambitious than in its prior outing two years ago now that it too benefits from some of the high-end video equipment the company used for its 2010 Ring Cycle. The show is a great chance to hear a number of the company’s Domingo-Thornton Young Artists including bass Erik Anstine, tenor Ben Bliss, and tenor Alexey Sayapin among others. It’s also a great chance to see José Rafael Moneo’s beautiful Our Lady of the Angels Cathedral, a local architectural landmark that surprisingly too few Angelenos have seen first hand. Of course, since the 7000 or so free tickets were already distributed weeks ago, you may not be able to get in, but the company just released several tickets to both performances yesterday, so you may want to see if you still have a chance. 2) Jacaranda Music in Santa Monica will present their latest program on Saturday and Sunday at First Presbyterian Church on 2nd St in an evening of their own American mavericks. In addition to pieces by William Schuman and Leon Kirchner, the evening will also feature the second and third string quartets from Christopher Rouse. The latter of these was commissioned especially for the Calder Quartet who will be on hand to play it. I heard them do so last summer in Santa Fe, New Mexico, and it’s a considerable piece of chamber music you should not pass up the opportunity to hear by one of America’s premiere chamber groups. 3) And speaking of string quartets, the Takács Quartet is coming to Orange County and the Irvine Barclay Theater on Tuesday the 20th along with Garrick Ohlsson playing Beethoven and the Shostakovich Piano Quintet. Shostakovich’s chamber music is a unique world unto itself, and this is not a piece one comes across everyday. Best of all the Philharmonic Society of Orange County is offering tickets at a 10% discount for folks who purchase online or over the phone when they use the code TAKACS10. That’s a good deal on a show from some great musicians. 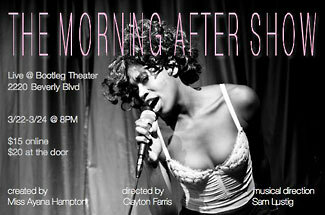 4) And last but far, far from least is the latest big stage review from L.A.’s next big comedy star and all around dynamo Ayana Hampton who’ll be bringing her latest Ayana Hampton Show creation, The Morning After Show to the Bootleg Theater in Hollywood for three nights on March 22-24. Miss Hampton’s freewheeling subversive comedy ups the ante on legends like Sandra Bernhard with the kind of bite that made her 2009 REDCAT performances unforgettable. And it’s only $15. It doesn’t get much better than that. 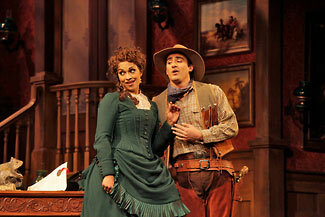 Donizetti’s Don Pasquale returned to the San Diego Opera last weekend in the third production of their 2012 season. It’s the first time the opera has been seen there in a decade and its return brought with it David Gately’s popular Southwestern-themed production, which originated there and went on to thrive in many cities around the country in the intervening years. It’s still very cute and suits Doniztti’s opera well. It’s still filled with ten-gallon hats, mariachi bands, and excuse for its tenor, in this outing Charles Castronovo, to show off his physical assets in a bathtub scene that opens Act II. What’s not to love? San Diego Opera fielded a solid American cast for this outing. (It’s first performances of the opera in 1980 included Giorgio Tozzi and Beverly Sills.) And Castronovo was undoubtedly a highlight even with his shirt on. His light and agile tenor is a perfect fit for this opera and his warm personality made his beleaguered Ernesto particularly sympathetic. The opera is named for Ernesto’s elderly buffoon of an uncle, Don Pasquale, who decides to take a much younger wife at the expense of Ernesto who will not be given permission to marry his young love Norina. Norina, however, who is in cahoots with Pasquale’s physician and advisor Dr. Malatesta, has other plans and soon hatches a plot to trick Pasquale into marrying her while she is pretending to be Malatesta’s convent-raised shy sister Sofronia only to exact her revenge on Pasquale by giving him far more than he bargained for when their sham marriage contract is signed. John Del Carlo stars as Pasquale and he still musters the power and breath control to manage the patter singing and coloratura work readily. He was somewhat foiled in the pit by conductor Marco Guidarini who insisted on rather languid tempi throughout much of the evening that Del Carlo couldn’t seem to quite coalesce with. Star soprano and Southern California native Danielle de Niese sang Norina and managed the pacing a bit better. She is a splendid actor with ample fire and stage presence. The spunky Norina seems tailor made for her in nearly every sense if perhaps not completely the best vocal fit. De Niese has made her mark on the opera world to date mostly by singing Mozart and Baroque roles, and while she is no stranger to bel canto parts, her vibrato tended toward the broad side and she had some difficulty sustaining longer vocal lines to their conclusion without turning a little breathy. But these vocal quibbles aren’t the kind of thing that distracts from the evening’s overall success, and first and foremost, this Don Pasquale is funny and charming. That, my friends, is what a comic opera is supposed to do. The show has two more performances on the 16th and 18th in San Diego. Los Angeles loves young fresh faces. And when they come with talent to match, sparks can fly. 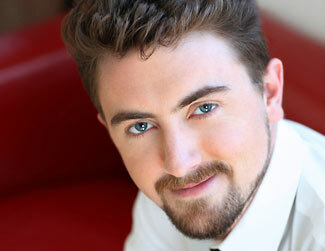 Which may just happen again later this month when the not-yet-30-year-old composer and pianist Timothy Andres arrives in Los Angeles for two high-profile performances with two very different local organizations. 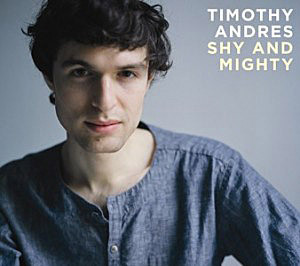 Andres is a fast-rising star in the musical world having already had his work included in programming from the Los Angeles Philharmonic in 2009, the year before he released his debut recording, Shy and Mighty, on the Nonesuch label. Press has been glowing, and new commissions are coming fast and furious making his upcoming L.A. appearances a high priority for anyone interested in the next generation of American composers. His music will be included in the latest program from wildUp, L.A.’s new music collective, who’ll consider current music scenes on the East and West Coast on the 23rd and 24th of March at Beyond Baroque in Venice. And on an even bigger note, he’ll appear with the Los Angeles Chamber Orchestra under Jeffrey Kahane on the 24th and 25th of March playing his completion of the Mozart Piano Concerto No. 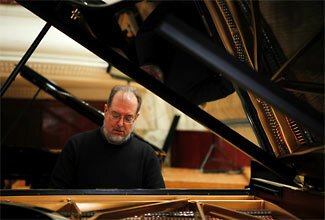 26 as well as his new piano concerto, Old Keys, a commission of the group’s Sound Investment program. Not excited yet? You should be. Prior to all this, Out West Arts was lucky enough to get Timo to take a stab at the ever popular 10 Questions. I have trouble separating the "creative" process from the day-to-day "getting notes down" process. For me, they mostly happen at the same time; it's not very glamorous. I almost always work directly into Sibelius. I've been composing on computers since I was a kid, so it feels natural. Occasionally I'll start with an audio mockup in Logic. The only thing I'll do by hand is the very outset of writing a piece, sitting at the piano and improvising and occasionally jotting down incomprehensible little notes to myself. That's in addition to all the other things computers help to do: recording, editing, playing random keyboard instruments, doing all my design and layout, doing my website, exchanging scores and recordings with fellow musicians—I even read most music off my iPad now, so there are pitiably few hours in a day that I'm not in front of some sort of screen. It's not one that I would have anticipated even a couple of years ago, and that is men's clothing. Out of school I dressed like any number of Liberal Arts College Graduates—that is to say, in striped t-shirts and skinny jeans. When I moved to New York I found myself in a meeting at my record label or something, and all of a sudden it was—I feel like a child right now, and not in a good way. Also around that time a friend of mine bought me a really beautiful jacket, and I realized I had not a single thing in my wardrobe that wouldn't look ridiculous alongside such a garment, so that started me down the path. Now I spend most of my free time trawling eBay or thrift shops, searching for, I don't know, the perfect houndstooth bow tie or something equally foppish. There are a number of other things I waste time on including bicycles, cooking, and repeatedly cleaning all surfaces in the apartment. You’ll be performing alongside the Los Angeles Chamber Orchestra on March 24 and 25 in a program that will feature a new commission from you for them, a piano concert entitled Old Keys. What should we know about the piece before hand? Here are some things you should know about Old Keys: it's an uncharacteristically neurotic piece for me, full of little details and inflections. It's a piano concerto but only in outward appearance; the piano part is not flashy or even that difficult. The entire thing is basically stitched together out of transitions, or at least each section is agitating to move on to the next; it never sits still and just contents itself with one or two things. That same weekend, L.A.’s young, fresh family of musicians wildUp will feature your music in a program playing off an imagined East Coast vs West Coast composer rivalry. Can’t we all just get along? Yes and no. West coasters, in my experience, tend to be genuinely open minded, which is so great. If there's rivalry it is solely between the East coast and its own self. Over here, critics and curators love to repeat that old saw about how today's young composers have no stylistic limitations, how we just "let it all hang out" all of the time, but in reality things are much more like that old Tom Lehrer song "National Brotherhood Week"—everyone comes out to Miller or Merkin to hear their friend's piece and puts on a friendly face for precisely as long as is needed ("be grateful that it doesn't last all year!"). At one of these things someone asked me if I was an "uptown or downtown" composer, which… just… never ask anyone that. Competition among composers is a funny thing. If you're, say, a violinist and you bomb an audition, it's easy to say "I had an off day" or "so and so practiced harder" and kind of take the brunt of the blame yourself. Composers are never like that. It's more along the lines of "Orchestra X didn't program my piece because they like that Euro crap/that post-minimalist crap/That New Complexity/That New Sincerity" etc. etc.—they think there must be some terrible extenuating circumstance or conspiracy turning things against them. My strategy is to remind myself that "a rising tide lifts all boats". If your friend gets commissioned by the LA Phil, how is that anything other than fantastic? It means the LA Phil is paying attention to your immediate sphere, your field, and bringing that music to new and bigger audiences. And you never know, your friend might drop your name at Deborah Borda or John Adams and they'll end up commissioning you next time. At first it was just pure harmony what did it for me. When I learned how to play major chords I thought they were the most beautiful sound imaginable. Somewhat later it was Beethoven, Brahms, and Ravel. Now hundreds of different things make me want to compose. Need you ask? Nixon in China. Whenever the hell you want? As long as it's not during a super beautiful quiet part? You’re equally well known as a performer in your own right, especially of contemporary music. In what way does your work as a performer of other people’s music influence your work as a composer? The two are linked quite inextricably. I perform my own stuff a great deal, of course, but it will never challenge me as a pianist in quite the way a score from someone else does. Ted Hearne's Parlor Diplomacy totally schooled me on how to play trills, I learned how to hocket and groove from playing Reich and Adams and Brad Mehldau, and Rzewski taught me about playing ridiculous counterpoint with one's forearms. And whatever I'm currently practicing finds its way into what I write, sooner or later—it's just unavoidable. It works the other way, too; I think I get a "leg up" on deducing a composer's intentions by being one myself. Playing the piano is also my primary means of discovering new music—I don't listen to contemporary music regularly (though I'm trying to find more time for that) so I'll often find out about a great composer by performing one of his or her works. You’ve been associated with at least two different larger groups of composers: the six person collective Sleeping Giant and more broadly, a generation of young composers currently living and working in Brooklyn. How important is it for you to be surrounded by a community of other composers in making the music you do? The proximity to fellow composers is a nice thing, and the Sleeping Giants are close friends and we love getting drunk together, so that's great. But technically we could collaborate from anywhere in the world—one doesn't need to occupy the same space in order to share work, create work together, critique said work, talk trash, and get silly. The Brooklyn/Greater NY area really comes in handy for performing. I love playing with groups like Metropolis Ensemble or ACME, chamber ensembles, bands, bandsembles (that's French), just any random and interesting gig that comes my way. Since college, my M.O. has been to stay as busy as possible at all times, and living in the midst of such an active community has allowed me to support myself doing just that. I'm grateful for it literally every day. What’s the next big thing we should be looking for from Timothy Andres? Some things I'm particularly excited about this Spring: playing a solo "opener" for the Brad Mehldau trio in Denver, then giving a full recital at Le Poisson Rouge here in New York, leading into my London début at Wigmore Hall in June. Also some new pieces in the works for next season that I'm thrilled about: a solo piece for the amazing young pianist Kirill Gerstein, a quintet for Jonathan Biss and the Elias Quartet, my first choral piece (!) for Present Music in Milwaukee, scoring a documentary, perhaps a song cycle, and some big new collaborative works with the Sleeping Giants. And a bit down the road, my next album—a collaboration with the wonderful young orchestra Metropolis Ensemble. Surrealism was the theme for the second production of Long Beach Opera’s 2012 season, a double bill of Martinů’s The Tears of a Knife and Poulenc’s The Breasts of Tiresias. The company, and its artistic director Andreas Mitisek who also served as conductor for the evening, went for the laughs on Saturday during the first of two performances at Long Beach’s Center Theater. This wasn’t a bad strategy for two reasons. First, surrealist works, such as the source materials for these short operas, often rely heavily on humor and ironic juxtapositions to make their points. Second, as my fellow-blogger George Wallace pointed out, Long Beach Opera has a more consistent track record with comedies or at least comic interpretations of more dramatic works. (Vivaldi’s Motezuma, Kurka’s The Good Soldier Schweik, and Shostakovich’s Moscow, Cheryomushki come immediately to mind.) And within this framework, this current production does achieve some level of success if it does so by overlooking the darker, more inherently complicated aspects of both pieces. The first piece on the program was the quick 20 minutes of music that make up Martinů’s The Tears of a Knife. In it a young woman, sung by Ani Maldjian, falls in love with the corpse of a hanged man. Despite her mother’s pleas that she instead marry a neighbor, who turns out to be Satan, she goes ahead with her plan. She is eventually disappointed by the one-way affair and kills herself hoping to be reunited with her lover in the afterworld. She is, only to discover that he, too, has actually been Satan all along. The troupe including Suzan Hanson as the girl’s mother and Robin Buck as Satan reached for the humor in this scenario, but it never seemed to connect in Ken Roht’s attractive staging. Part of the issue here was the diluted sound of the chamber sized orchestra which, as with previous LBO performance in the Center Theater, keeps them at the rear of the stage behind a scrim. The jazz-influenced score doesn’t have a lot of time to make its impact, and musically the performance seemed dull and unfocused. Luckily, Poulenc’s adaptation of Apollinaire’s play The Breasts of Tiresias, which was both longer and larger, seemed a more natural fit for the resources at hand. Poulenc's sly wit shines through in what is often very accessible, tuneful music that Mitisek and the orchestra had a firmer grip on. Maldjian returns to play Thérèse, a woman so enamored with feminist ideals that her breasts turn into balloons and float away turning her into Tirésias. Her husband, Buck again, is so frustrated by this and his inability to meet the cultural imperative of procreation, he elects to generate 40,000 of his own offspring through the miracles of modern science. Hilarity ensues and there is a requisite happy ending. Roht’s staging comes alive with a chorus that at times appears as party goers and then later surfaces as a legion of infants who write novels about Mme. Butak among other artistic endeavors. Roht is a choreographer by trade, and the sense of movement and physical space is strong. There are some video elements designed by John J Flynn that are projected behind the cast, including images taken from Magritte, in case we failed to get the point otherwise. The cast is more certain in these proceedings including a wonderful duet between Doug Jones as M. Lacouf and Benito Galindo as M. Presto. All of this is wrapped up in candy colored outfits and scores of balloons for a conclusion that may be a tad more crowd pleasing than it needs to be. Long Beach Opera has managed a view of surrealism that is very much tuned into the humor found in the strange and unreal, but not always so in touch with the scary and dangerous side of the same coin. The program repeats on the 17th of this month. Talk about a quick turn around. After a rather stodgy and dreary opening to the San Francisco Symphony’s latest iteration of the American Mavericks Festival on Thursday and Friday, the ensemble returned Saturday with a superb second program, likely one of the best you’ll see anywhere this year. The material was no different, 20th-century masterpieces from American composers including John Cage, Lukas Foss, Henry Cowell, and Carl Ruggles. What was new was a spirited attitude that injected some life and a whole lot of fun into what the cutting edge was. The show’s highlight was the first half of the evening dedicated to John Cage’s Song Books from 1970. The piece is a daunting collection of 90 short works that are equal part theater and music. Most of these consist of instructions to perform certain acts that may or may not make sound, and Cage was often indeterminate about both text and musical content, allowing for extensive borrowing from just about any source a performer might choose. One song instructs the performer to select a seat in the auditorium using random lines on a transparency and a seat map. Once the seat is selected, the performer leaves the stage to deliver a gift and then return. The singers are miked and perform both standard vocal lines in some works and combinations of guttural or chirping sounds at others. There are recitations of various texts and and every day noises like card shuffling and chopping vegetables as well. One smart move on this evening was that the Symphony hired three legendary vocalists, Joan La Barbara, Meredith Monk, and Jessye Norman who accompany the handful of orchestral players who would wander on and off the stage. The second smart thing they did was to hire young stage director, Yuval Sharon, to construct a large scale staging for the performance. Sharon brilliantly organizes the stage around three screen-covered huts at the rear of the space and then allows the songs to unfold often simultaneously in an organized chaos Cage would have approved of. (The photo above is from the San Francisco Symphony's own site taken at the final dress rehearsal performance.) 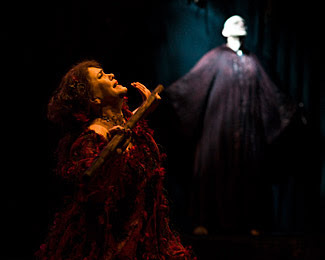 At the beginning of the performance from the dark, one heard cooing and then La Barbara’s face appears on the left screen projected from a live video camera somewhere yet to be revealed. Slowly the curtain on the second hut raises to reveal a bedecked Jessye Norman in a flowing gown singing the music of Satie. Cage provided songs that used electronic processing of Satie’s music, and, though restrained, it provided a most royal entrance for La Norman. Soon the stage is filled with players dressed either casually or in tails. Some sit at one of three table engaged in any number of tasks including reading and tearing paper or moving around other objects. Two pianos rest at either side of the stage and and are periodically played and then abandoned. There are neon lights that flicker on and off and eventually Monk strolls onto stage chirping and clicking as she slowly strolls or waddles around the space. Monk will later try on a dress and has one of the more humorous parts of the evening reciting lines about the kind of government "we need" that directly references the work of Thoreau. The players come and go as Cage’s songs start and stop, all playing out simultaneously one against the other. Michael Tilson Thomas joins the fray at one point picking at the strings of a piano and throwing paper. The vocalists move about and amid the organized chaos creating some beautiful images. Some are projected on the screens of the huts such as barren trees or maps of Concord, MA. Other images are ironic living ones like seeing Jessye Norman peck away on an amplified typewriter. (The performance generated video projections reveal that the text she composes is in French.) If you have ever loved Ms. Norman in performance, this unexpected, unusual turn to the music of John Cage will make you do so all over again. All of this bustling hour-long activity from the basketball dribbling to the electronic blips and whirs drove right to the heart of Cage’s project, recognizing the music in everyday sound around us all. Sharon’s staging captures that wonder on the largest possible scale by creatively playing out these individual songs one atop the other in a continuous cascade. Not everyone in the audience could relate to this sophistication and there were some boos and a handful of walk outs, but that’s as it should be. This music should strike some nerves, and it certainly did on Saturday. This magnificent theatrical opening was a tough act to follow. But when the orchestra returned with Tilson Thomas, the events of the first half of the evening had lit a light under them and they dug into the following discordant early 20th-century works with real zest. Lukas Foss’ Phorion, an orchestral deconstruction of a Bach solo violin partita sparkled. This nearly deranged ten minutes was followed by Henry Cowell’s 1928 Piano Concerto with its percussive, nearly hammering playing. Soloist Jeremy Denk proved as adventurous as the soloists in the first half of the evening, bracing his forearms and elbows as they repeatedly crashed against the keyboard for this rhythmic rocker of a piano concerto. The evening ended with Carl Ruggles Sun-treader from 1931 with its cacophony of crashing brass and discordant, sometimes wailing strings. It was a great show that tapped directly into that maverick spirit the series is purportedly all about. All of this material will be repeated here in San Francisco on Wednesday and lucky audiences in both Ann Arbor and New York in the coming month. The San Francisco Symphony is in the midst of their 100th anniversary season which has been filled with exciting programing and great reminders of its past at every turn. The orchestra has a history of coveted relationships with local 20th-century composers and some of these ties are featured prominently in their current American Mavericks series, which kicked off this week in a series of programs that the group will take on tour in Chicago, Ann Arbor, and Carnegie Hall under music director Michael Tilson Thomas. It’s music most American symphonies don’t play every day, which is a plus even if the opening program, which I heard on Saturday night felt more like a flashback than looking into the future. This is not the first time Tilson Thomas has brought American Mavericks to the stage in San Francisco. The first was in 2000 and this reprisal run contains almost exclusively works the orchestra has performed under him before with a few new commissions from well-established figures like John Adams and Meredith Monk. And as Tilson Thomas acknowledged from the stage prior to the start of the evening, the term “maverick” has meant different things at different times. (Or as the 2008 election taught us, it may have no meaning whatsoever.) And on opening night the word's meaning was definitely a historical one with works from composers who were outliers in the world of art music in their own times if not quite so much now. Two of the works on the program were further outliers in that they were orchestral transcriptions or adaptations of better known solo piano works. The night started with Copland’s Orchestral Variations, a 1957 arrangement of his earlier Piano Variations now for a small ensemble. Tilson Thomas mentioned his own close relationship with the composer and noted that in his later years, Copland had given him his blessing on developing a further large-scale orchestral expansion of the work that Tilson Thomas described as “just something we do.” The work’s brief 10 or so minutes do still maintain the sort of angular and percussive sound Copland had cultivated prior to completing the later music he would be most remembered for. Still, the piece felt like a curiosity or an abstraction of a much more substantial work in a modern day equivalent of those opera transcriptions for piano and organ that were so popular during the 19th century. This same unsettling feeling also plagued Ives' A Concord Symphony which closed the evening. Ives’ landmark A Concord Sonata, written nearly a century ago, is undoubtedly a piece that may be the well-spring of all 20th-century American art music. In the hands of a performer like Aimard it can still stun an audience into silence. The love of the piece was so strong for composer Henry Brant, that he spent decades working on an orchestra transcription of the work, which was completed in 1994. In this format it still fascinates with its references to popular culture of the late 19th century fused to the most unexpected music that deconstructs this material as quickly as it picks it up. But there is still something lost here, the broader orchestral palette of sounds abandoning a kind of unity in the original piano sonata. In between these two orchestral oddities, was Lou Harrison’s Concerto for Organ with Percussion Orchestra. Harrison was another local composer that Tilson Thomas noted had a long-standing relationship with this orchestra. 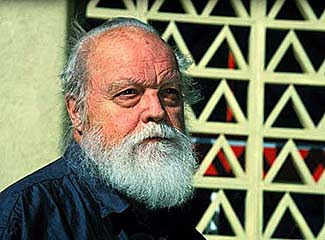 (There's been a lot of reflection on Harrison here lately in the wake of the recent opening of Eva Soltes's excellent documentary on the composer Lou Harrison: A World of Music that is still playing in town.) The concerto incorporates Harrison’s interest in Asian music and instrumentation in an odd combination of percussion players alongside the organ, played here by Paul Jacobs, which sometimes serves as a point of contrast. It’s not unpleasant, but it could also sound like Messiaen played by your high school marching band. That’s not necessarily a bad thing. And while this program seemed appropriately historical for the occasion, none of it seemed particularly compelling in the here and now. These were memories of Mavericks past, not those still pointing the way to the future. Do you really need another set of the Beethoven symphonies? 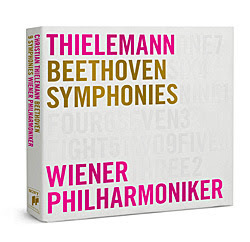 I was skeptical too, I admit, but if it's this recent release of the live recordings made by the Vienna Philharmonic under Christian Thielemann from 2008 through 2010, you might just. The recordings have been released already in DVD and Blu-Ray formats in 2011, but Sony has put together this single set now for those not inclined towards high end home theater systems. Poor Beethoven. You'd think the most famous name in music had fallen upon the hardest of times. His music apparently now requires entire months of radio programming to convince people to appreciate it. Concert programmers as recently as last week were still trying to explain why his music even matters. How things got this bad for the old man are unclear. But listening to a recording as good as the Vienna Philharmonic's recent symphony cycle under Christian Thielemmann reinforces how inane this kind of marketing blather is. These performances do all the explaining anyone could need. These are big-boned Romantic performances that make the most of the Vienna players' polished, exacting sound. It's almost as if Harnoncourt never happened. But this sort of fleshy Beethoven, popular half a century ago never really went away on world stages, and Thielemann taps into this with interpretations that are bright sounding, and often muscular. There is nothing retro about this work, however, and the symphonies sound as fresh and lively as ever. Thielemann has a strong sense of dynamics and pushes tempi in both directions but never to the point of losing the bigger picture. And if you are looking for an argument for why buying physical recordings still matter, this is it. A digital download may be infinitely more portable, but it isn't as much fun to peruse as this white, cloth-bound set with individual paper sleeves for the discs. It's a lovely set and includes a bonus DVD with interviews and excerpts from the DVD releases as well. Help yourself. You need an Easter gift. Hot on the heels of one big ambitious Spanish-language theater production at REDCAT comes another. Timbotou, a world premiere production developed in a collaboration between the CalArts Center for New Performance and the University of Guadalajara Foundation, takes its constituent parts from materials much closer to home, though. 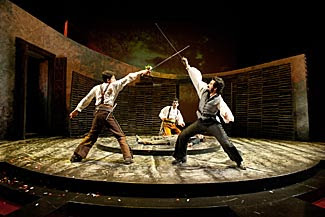 The play written by Alejandro Ricano and directed by Martin Acosta, like its cast and creative team, lies on the border between the U.S. and Mexico, incorporating elements from communities on either side of this imaginary division of space into a vision that emphasizes the inter-relatedness of all its elements. Acosta and his design team have created an arch, visually compelling world that shoots for some ideological heights even if the bare knuckle storytelling in the two hour intermission-less performance is frequently far more pedestrian and earth bound. Timboctou refers to an imagined place, the one farthest from wherever its characters are at any given time, that would provide escape from the particular stressors or crises at hand. And there’s a lot of the world the characters in this world would want to get away from including drug trafficking, government corruption, global warming and murder. The play is episodic and focuses on several sets of loosely interrelated characters, whether enacting or coping with the consequences of various illegal activities. 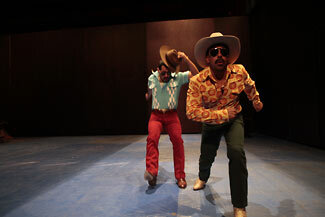 Dany, played by Mario Montano Mora, and his twin Chucho, an equally humorous Axel Garcia, open the play trying to dump the corpses of several murder victims in the parking lot of a McDonald’s restaurant in Tijuana. Their highly choreographed movements stand in contrast to the darkly comic banalities of their debates about the spelling of “sabes” in a warning note to accompany the bodies they are to dispose of. The tone here sharply emulates the kind of banter Quentin Tarantino’s entire career is based on, and Ricano’s script is funny if far less sharp and effective than that. Soon the story spins into various directions looking at closely related plots that impinge on Dany and Chucho’s world including the visiting Spaniard they meet earlier in their travels and later the vacationing San Francisco college students who will accidentally kill him during a drunken beach brawl. It’s a structure that calls to mind another film, Steven Soderbergh’s Traffic with its network of lives created and destroyed by the illegal drug industry. There are comical, incompetent government officials, stiff DEA agents, and mourning family members that populate Timboctou. Some of their vignettes work better than others but all share the same gabby, comical tone. Timboctou, which is mostly in Spanish and uses projected supertitles on the walls of the set, is at its best when it unhinges itself from all this wordplay and runs with the surreal imagery that fills its physical space. The set is dominated by a mountain of rusty office chairs that at one point takes off in motion and becomes a shifting metaphor for a number of issues in the play. There’s use of performance generated video feed which is fed into a small monitor suspended from the ceiling throughout most of the performance. The stylized choreography of the opening scene remains consistent over the show's running time as well. There are also repeated references and visual projections of polar bears, creatures that Dany and Chucho imbue as inhabitants of the world farthest from them, but one still endangered by the global warming destroying their habitat. The twins see themselves in these endangered animals struggling in an increasingly hostile habitat. Later the bears actually arrive and dance to Handel’s “Lascia ch’io pianga”, an aria best known for its use in the 1711 opera Rinaldo. Ricano and Acosta have an eye for the absurd and a visual language to go along with it. There’s power in Timboctou that suggests the show has something to say and places to go. But the evening still wants for more consistency and a looser, less narratively driven structure, which tends to dilute and reduce the power of its impact. Still the show offers a lot to think about and represents REDCAT’s commitment to theater events without any other comparable home in town. The show runs through Sunday the 11th downtown.